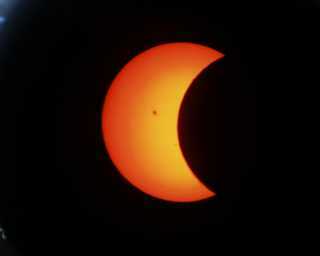 Some ETX users have sent me examples of their astrophotography. 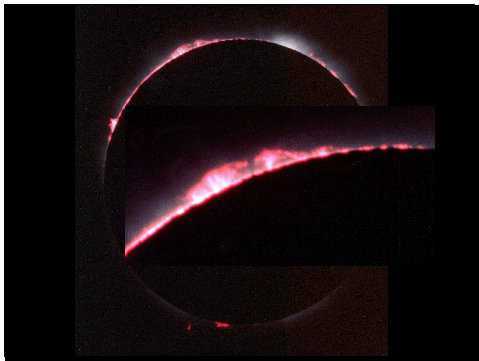 If you have some examples you would like included here please send me a description of how you made the astrophotos and a copy of the images as GIF or JPEG files (due to internet email gateway issues, please send only one image file per message). Send to etx@me.com. Alternatively, if you have created your own web page with your examples please let me know and I'll include a link to your site. I thought you may like to see (and post) the my shots of "the partial" from Peterborough, Ontario, Canada. They were all shot using an ETX and a Canon Ftb at prime focus. A Thousand Oaks 2+ filter was used with 200 ASA print film at 1/125 exposure. 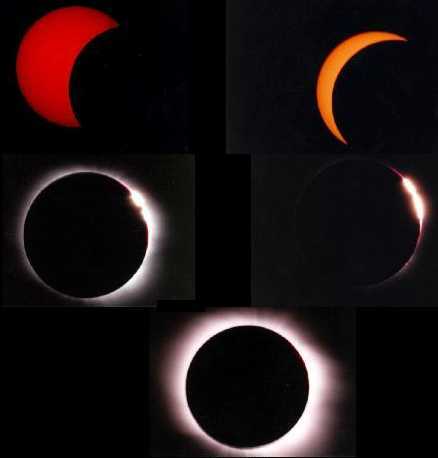 The attached sequence shows a sampling of the whole series from the 11:00 a.m start to the 2:11 p.m. finish and the 12:36 p.m. peak. Enjoy! 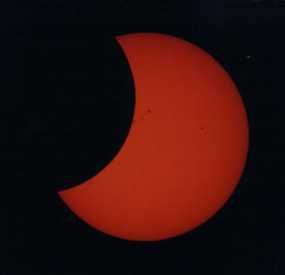 Here is a picture of the December 25 Partial Solar Eclipse. The picture is a little fuzzy, but considering that the picture was taken under very windy Southern California Santa Ana Wind conditions, it is about the best I could do. The picture was shot at prime focus using an ETX90 using Kodak elite 200 slide film with a 1/30 second exposure. The time is approximately 0830 PST. I used a sun filter. [Top] This photo was taken at 12:54 EST, 12/25/00 in Jamestown, RI (41.29N 71.22W). 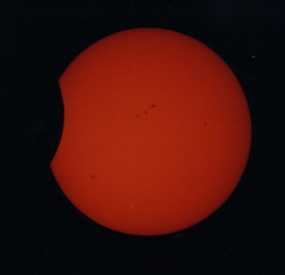 It was taken with an ETX 90 at prime focus, short barrel, with a Canon EOS D30 digital camera at 1/60. 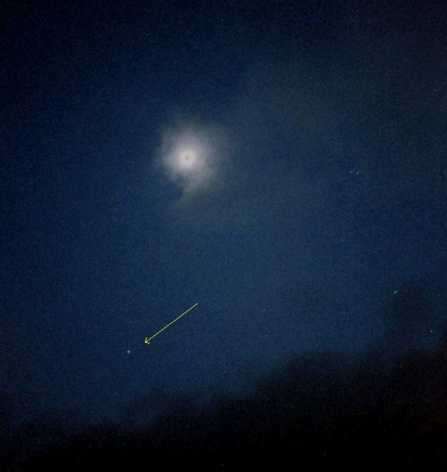 [Bottom] This photo was taken around 12:55 EST, 12/25/00 in Jamestown, RI (41.29N 71.22W). 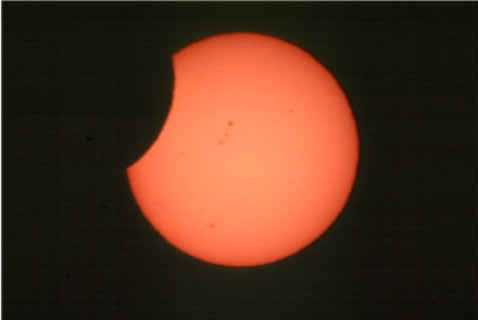 It was taken with an ETX 90 with eyepiece projection using a 50mm? Paul Rini? eyepiece with a Canon Elura 2 digital video camera. 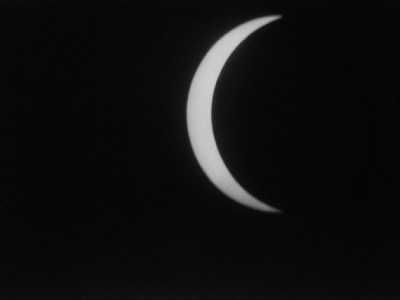 I attach an example of last years solar eclipse pictures i made with my old ETX90 and an OLYMPUS OM1 Camera at the prime focus of the ETX. Location where we watched the event was on the border of East Austria in Hungary. 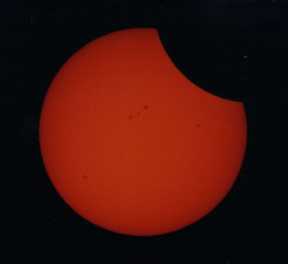 All phases of the eclipse are available in highest resolution for printing Large Posters. If you want a picture with higher resolution and nice details i am ready to send. However for a first check the filesize is much to high! 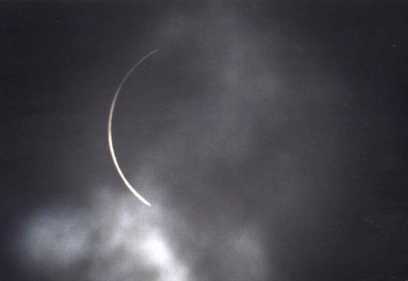 These were taken from the deck of the Vistafjord in the Black Sea on 11 August 1999. 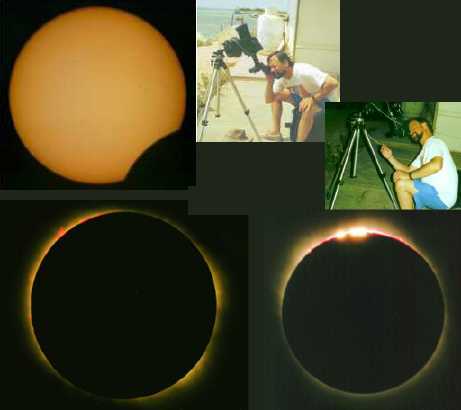 One image is with a Minolta Maxxum 7000 attached to the back of my ETX (an older 90mm) using Kodak Gold 400 and the Meade ETX T-Adapter with the extension. I have NO idea what the final focal length is, but I cannnot bring it into focus without the extension! Settings, if you believe it, were automatic, but a cable release was attached. 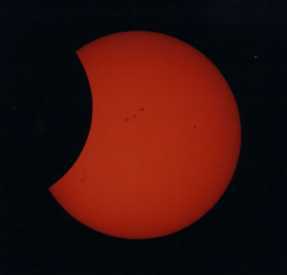 The other image is from a Minolta Maxxum 3si mounted on top of the ETX, with a Sigma 28-200 zoom lense and a Tamron 2x 7-element extender set to maximum (for 400mm), also with Kodak Gold 400 at automatic. Pictures were taken by pressing the timer release to attempt to minimize vibration. As a note, my Pelican cases protected my scope and cameras wonderfully. Hope you enjoy the photos. I've just surfed in your site, dedicated to Etx. 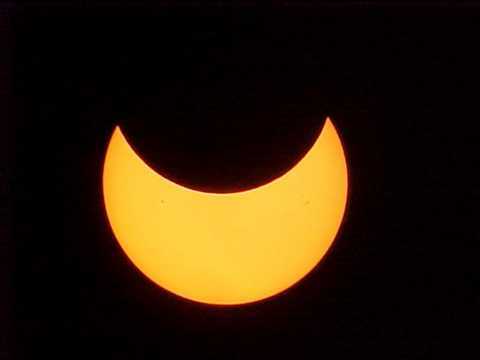 I send you some photo taken in Balaton lake during the last solar eclipse here in Europe (11 of Agoust). 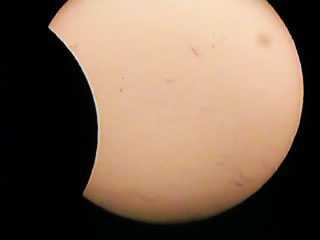 The photos were done with a focal lenght of nearly 1600mm, obtained with an extension from the prime focus. 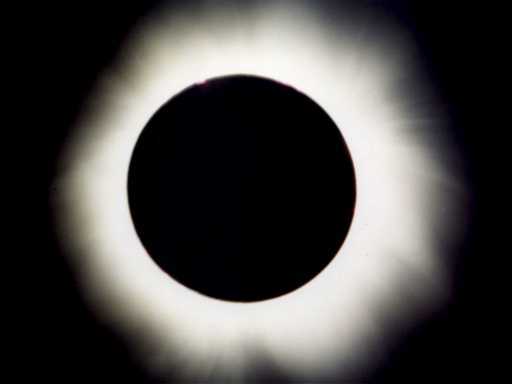 The film was an Agfa superia 200 asa and the exposure time were 1/2000, 1/500 and 1/2000. My e-mail address is mrc@keycomm.it. Please put a link to my home page, www.keycomm.it/users/mrc. 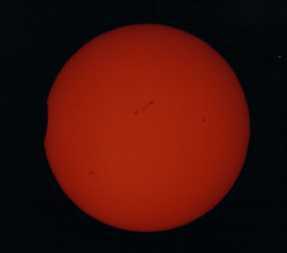 *the first : no clouds, 100ASA, 1/60 sec, f/16, 1450mm ETX RA, scanned at 300 dpi and zoomed with PaintShopPro. 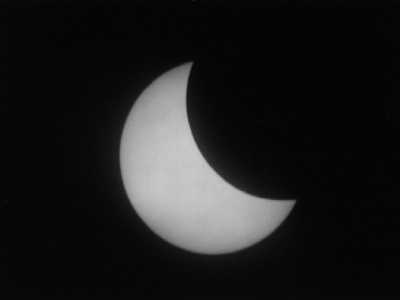 *the second: 800ASA, 70 mm Compact 24*26 hand held. 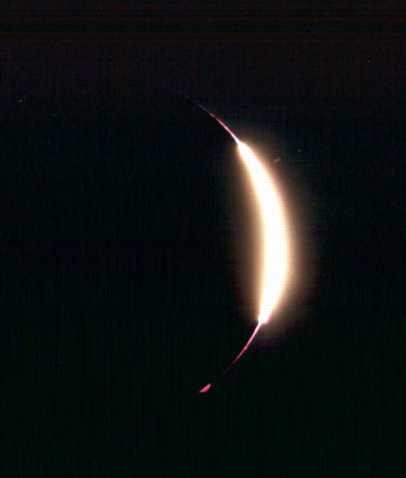 Venus at the bottom. Best regards and thanks for your site. I trekked to Paris for the eclipse but, due to various bits of bad luck, I missed the path of totality by a mere 20 kilometers or so. Oh well. I did manage to snap some photos through the ETX. http://www.wuut.net/~geordan/eclipse-pics.html for the images and a brief story of what happened. I tried my hand at taking a photo of the last quarter moon; that can be seen at http://www.wuut.net/~geordan/images/sky/moon.jpg. I should probably crop that down a bit. I have an ETX and I took it on my holiday/vacation to Northern France - nothing to do with the Eclipse of course - (That what I told my wife anyway). Luckily I caught totality between clouds. My first (sorry second) attempt at Astrophotograhpy - I don't think they are toooo baddd :-). I have compiled a web page from the results - I hope you dont disapprove too much of some of the adulterations that went on (I just about exhausted all of the options with PaintShop Pro on this one!). Some of the prints survived intact though! 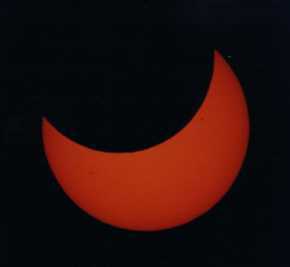 and follow the links to the eclipse pages. 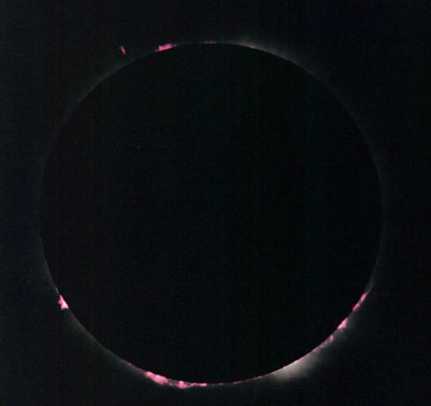 Please find 2 pics of the 11 august 1999 solar eclipse. They were taken near Neufchatel en Braye, a little town in Normandy located on the centrality line. ETX RA - T64 adapter (only the short part) - Nikon F3 - Fuji 200. 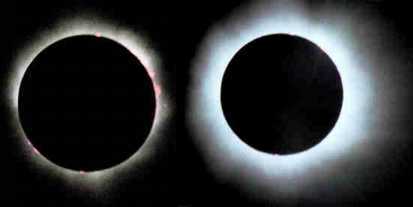 Left pic : 1/125 s. Right one 1/15 s.
This pic was shot 08-11-99 during the solar eclipse in germany near nuremberg at 1035 h UTC. 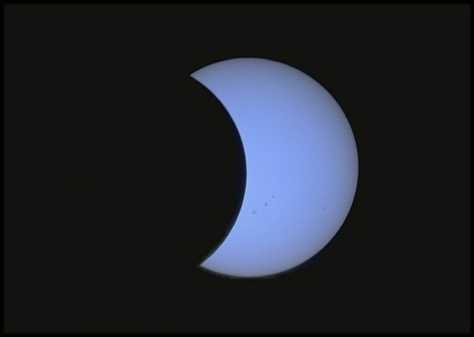 It shows 98% of eclipse. 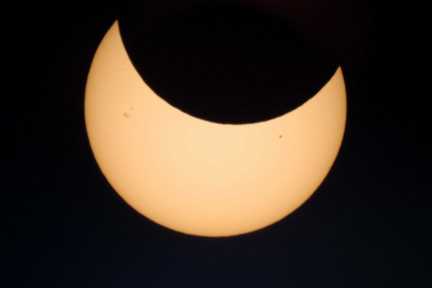 Here is a picture my husband and I took during the solar eclipse of august 11th, in France. 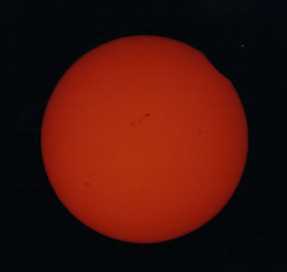 We used our ETX-90 and a Canon EOS 1000F camera, with a 100 ISO Kodak film. 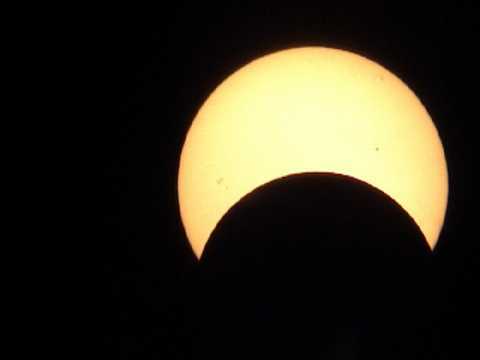 All the pictures we took are available from our web site, at the following address: http://www.a2points.com/homepage/8235722/eclipse.htm Thank you for all the information you provide on your site. It is of great help. 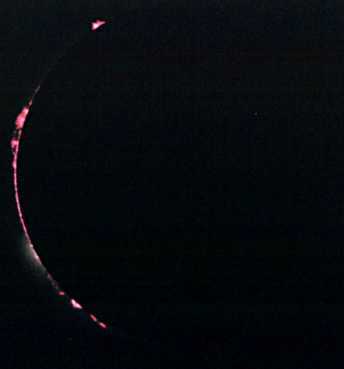 at the last item in the summary 'quelques travaux' or 'some jobs' in english, some picture of the last total solar eclipse of 26/2/98 in guadeloupe made with my ETX in prime focus on EKTAR 100 there is also a movie made with the pictures. 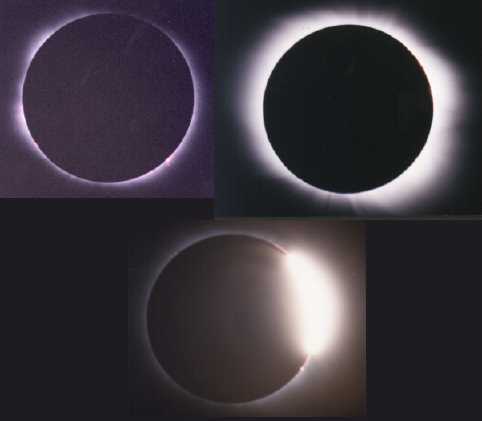 Here are three different images of the eclipse taken from Aruba Feb 26, 1998. I did have some tracking errors with all of my equipment on my ETX despite polar aligning the scope the night before. There was no Dec drift but the scope could "not keep up" in RA. I'm going to work these photos into a set of pages chronicling our cruise--when I get the time. 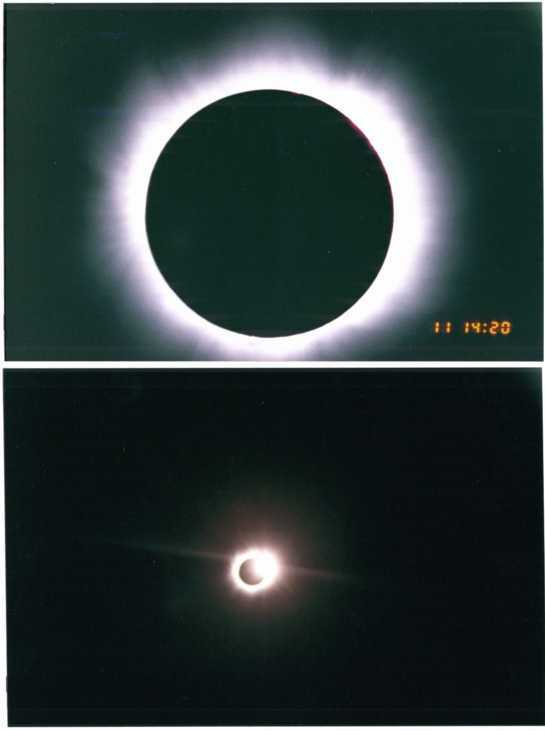 Here are some pictures that I took of the February 26, 1998 solar eclipse in Aruba with my ETX. The motor drive was so accurate that I didn't have to adjust the alignment for more than 2 hours. 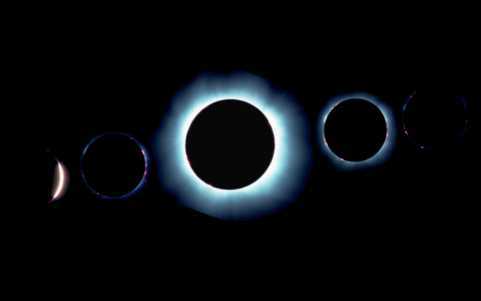 The first picture is just after "first contact" The second is of my self 10 minutes before totality, picture from my wife's olympus. 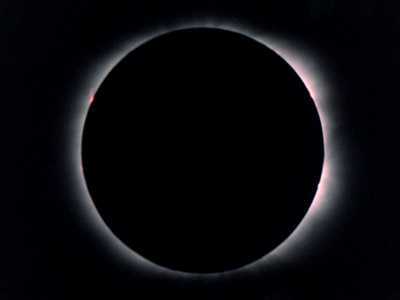 The third is of me at totality, it was so dark that the navigational bouys started blinking. 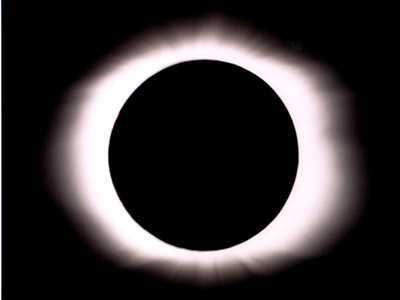 The 4th is of the begining of totality. The last is of the "diamond ring" effect. All of these images were taken with the ETX as pictured, except the ones of the ETX. Check out the complete set of eclipse photos: www.uninorte.edu.co/~lpertuz/. 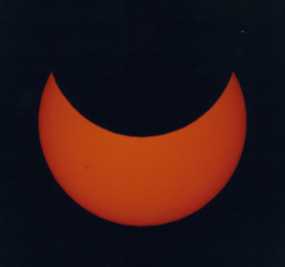 Here is a photo of the Feb 26 eclipse taken with the ETX, 26mm eyepiece & Casio QV-10 digital camera in Newport, Rhode Island Lon 71.19W Lat 41.29N. 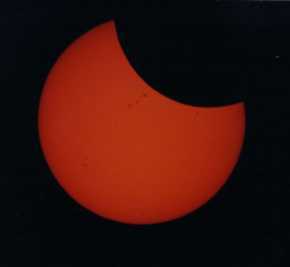 See Guest Solar Eclipse Photography for photos posted in 2001.